I can’t believe I managed to crawl around under the house today! You see, I don’t do well with creepy crawly creatures and I usually scream upon reptile sighting, even at a distance. Fortunately, I did not see anything today that got my heart racing. Phew…. Since I don’t have one of those jumper suits for crawling around dirty spaces I wore my mud-stained hiking clothes and made sure that my 20″ hair was tucked nicely inside the shirt. I put an old baseball cap on my head, backwards, and strapped on my halogen headlamp. With a camera in my hand, I stuck my head into the opening on the south end of the house. The opening is certainly big enough for an adult male to crawl through so I had no problems getting in and maneuvering around. Once I got over the large pipes I found that I could actually crawl on all fours instead of slithering around. The clay soil was slightly moist but not wet. 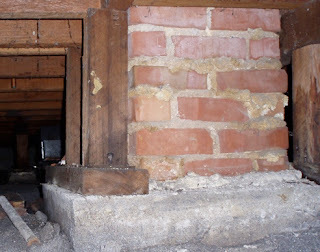 I took pictures — first west, north and east walls then I crawled towards the center of the house where remains of a brick fireplace was under the kitchen. There are 4 columns of 10 posts running north-south direction. 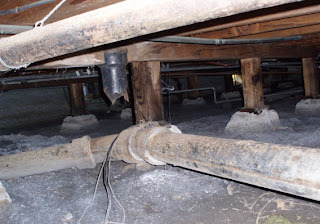 I saw knob and tube wiring, old floor furnace and galvanized steel piping. These are all the stuff we saw on the home inspection report when we bought the house and intended to replace them so it wasn’t surprising. Radon was one of the topics covered in the Indoor Air Quality class we took recently. We understand that the concentration of radon gasses that naturally come out from the soil various from region to region and in some cases from house to house. 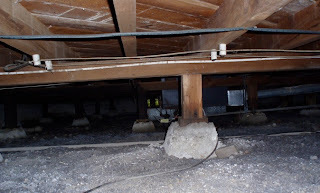 Our instructor, Rich Prill, Washington State University’s Extension Energy Program, mentioned that one of his clients found higher level of radon compared to the neighbor’s houses because there is a subterranean stream running under the client’s house some 10-20 feet below surface that affects the gas composition of the soil under the house. So, even if the radon zone map of California show that we are in a moderate area (predicted average indoor radon screening level between 2 and 4 pCi/L), we should test for it. Radon is a noble gas that doesn’t react with anything else. It’s present in our soils, rocks and sometimes water. The problem with radon is that it has a 3.8 day half life during which it goes through radio active decay, releasing alpha particles that can cause lung damage. So, if you breathe in radon, which is a colorless and odorless gas, these large alpha particles can damage and mutate cells in lining of your lungs. Radon is the second leading cause of lung cancer after smoking. So where does it come from? You’ve heard of uranium, right? Uranium 238 is the most prevalent naturally occurring radioactive material in the ground. It has a half life of 4,500,000,000 years. Uranium 238 eventually turns into radium 226, which has a half life of 1590 years. Then radium 226 turns into radon, which has a half life of 3.8 days. At this point you may ask, “What is half life?” Half life means the period of time after which only half the mass of the original radioactive element remains. So, suppose a radioactive material starts with 100% of a radioactive material, after a single span of its half-life only 50% of that radioactive material would remain. The other 50% of the material would have converted either into energy or another element which may or may not be radioactive. Why do you want to test for it? Radon is a colorless, odorless gas and it occurs naturally and it’s in our soil at different concentration. The gas comes out of the ground and it can get into your house if the floor is not airtight. 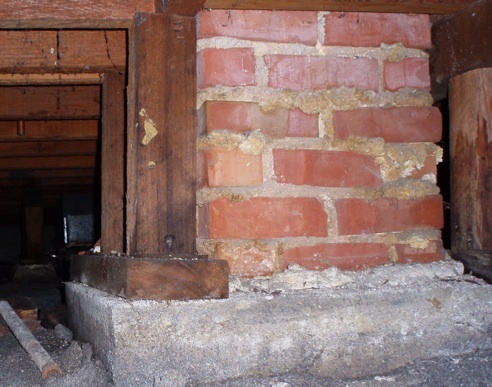 Most houses with crawl space like ours is not airtight. 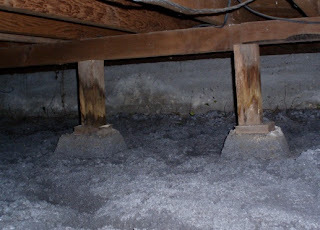 We know it’s not airtight because we can smell the dampness and mold from the crawl space when it rains. So, if there is any radon in the ground, it would certainly get into the house. In fact, when it rains the water in the ground acts like a air and vapor barrier so any radon gasses in the ground would look for path of least resistance, or dry soil to release. The dry area happens to be under the house so when it rains the crawl space may have extra concentration of radon. The testing result could be different from day to day, depending on the season, rain and stack effect. EPA gathers data from the various testing conducted by labs and publishes results (aggregated by zip codes) on a map. California Department of Health publishes a report that lists the number of tests conducted in a given zipcode as well as the number of tests that resulted in level above the EPA threshold of 4pCi/L. You can find the PDF here. So, I just bought some short term radon test kits at the neighborhood hardware store and will test the house. If the results show a level higher than 4pCi/L then we would take measures to mitigate it by putting in a pipe under the plastic sheet used for sealing off the crawl space and venting it to the outside. You can find a PDF of radon resistant construction here. UPDATE: Our result for the short term (96-hour) Radon test was .2pCi/L, which is quite low! Organized home tours are great way to get ideas, meet interesting people and learn about the house. Architecture and landscaping gives a certain “feel” to the house. Finding out about material choices give an insight to the owner’s values. Learning about various systems used, like solar thermal, photovoltaic, energy management, rainwater harvesting and gray water systems has been interesting and often inspiring. Years ago, when we’ve attended “Solar Homes Tour,” or “Green Homes Tour,” or “Open Architecture Tour,” we would dream about doing a green house project of our own someday. After visiting a home we would note, “How we felt,” at the house and discuss what we liked and disliked about the house. These tours were planting seeds in our mind. After going to so many of these we found that our tastes and preferences were similar so when we decided to do our Midorihaus Project we simply germinated the seeds that were planted through the tours. This year we’ve been to several “Passive House Tours” in the Bay Area. Unlike the one day organized tours of several houses where people come and go all throughout the day, these Passive House Tours are compact and provide the visitors with an in depth view of the project. At each of these sites there is a formal presentation with a team of architect, builder, passive house consultant and sometimes the owner that presented the highlights of the project. They’re all quite passionate about building energy efficient homes and are generous with their time. We’ve learned so much from talking to different people at these tours! This is a brief list of passive house tours we’ve been to this year (2011). March 27 – Cottle Zero Energy Home in San Jose, designed and built by One Sky Homes. May 13 – Green Gulch Farm at San Francisco Zen Center at Muir Beach. June 1 – Menlo Passive Project in Menlo Park by Clarum Homes. Green Home Project in Palo Alto that is going live on June 4. This site will host the next monthly meeting for Passive House California on June 26. Of course, sometime in 2012, we will host a tour of our Midorihaus Project in Santa Cruz.